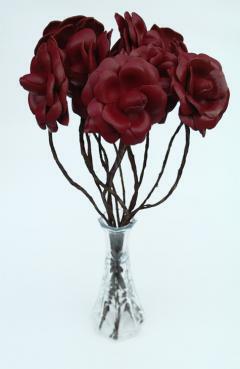 These leather flowers are perfect for a 3rd Anniversary Gift, traditionally the "Leather Anniversary" and also work well for the 9th anniversary as the "modern" 9th anniversary gift is leather or for any occasion that you would like to send a unique flower gift that will last. The flowers are made from genuine leather on natural material (rope-like) wire stems of about 8" in length. Red rose blooms are about 2 inches wide.